Impressive performances, the efforts of China’s Zheng Peifeng and Zhu Linfeng caught the eye, likewise the Czech Republic’s Lubomir Jancarik and David Reitspies attracted the attention, as play in the opening round of the Men’s Doubles event at the Seamaster 2018 ITTF World Tour Asarel Bulgaria Open in Panagyurishte commenced on Thursday 16th August. However, the pair to attract the attention above all others was the English combination of Paul Drinkhall and Liam Pitchford. Zheng Peifeng and Zhu Linfeng upset the order of merit by beating Poland’s Marek Badowski and Patryk Zatowka, the no.7 seeds, in four games (11-7, 8-11, 11-2, 11-7); by a similar margin, Lubomir Jancarik and David Reitspies ended the hopes of Bulgaria’s Teodor Alexandrov and Denislav Kodjabashev (11-8, 8-11, 11-8, 11-7). Good form but neither pair could match the form displayed by Paul Drinkhall and Liam Pitchford, the winners earlier in the year of the Men’s Doubles title at the Gold Coast 2018 Commonwealth Games. They beat Sweden’s Mattias Falck and Pär Gerell, the no.6 seeds in a most authoritative straight games manner (11-7, 11-7, 11-3). In recent years, Mattias Falck, the former Mattias Karlsson, has enjoyed outstanding success partnering Kristian Karlsson, like Pär Gerell, a left hander; simply in Panagyurishte, the chemistry did not work. Three upsets, in the remaining contests it was a status advised but there were close calls. Japan’s Masataka Morizono and Yuya Oshima, the top seeds, needed the full five games to beat the combination of Belgium’s Robin Devos and Finland’s Benedek Olah (10-12, 11-4, 11-8, 7-11, 11-6), as did Koki Niwa and Jin Ueda, the no.3 seeds when also confronting Belgian opposition. They were tested by Cédric Nuytink who partnered Frenchman Quentin Robinot (8-11, 11-9, 6-11, 11-6, 11-7). Disappointment for Belgium and there was more; Florian Cnudde and Thibaut Darcis suffered at the hands of Chinese Taipei’s Liao Cheng-Ting and Lin Yun-Ju, the no.5 seeds (11-6, 11-8, 11-4). 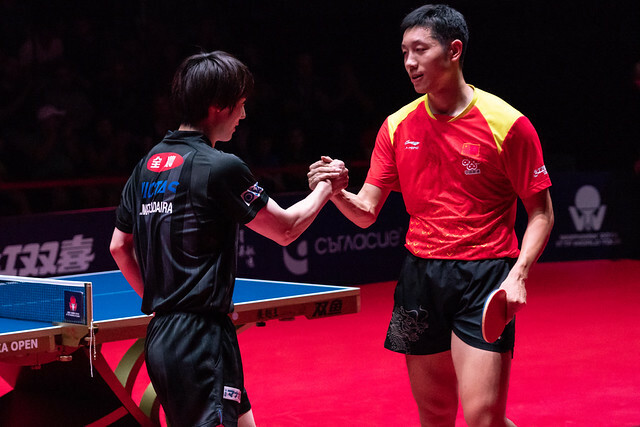 A straight games first round Men’s Doubles win for Liao Cheng-Ting and Lin Yun-Ju; it was the same for Hungary’s Nandor Ecseki and Adam Szudi, as it was most ominously for China’s Ma Long and Xu Xin. Nandor Ecseki and Adam Szudi, the no.4 seeds, beat Turkey’s Ibrahim Gündüz and Abdullah Yingeler (11-2, 11-5, 11-8); Ma Long and Xu Xin, the no.2 seeds, ended the dreams of Korea Republic’s Baek Hogyun and Kim Daewoo (13-11, 11-5, 11-5). At the quarter-final stage Masataka Morizono and Yuya Oshima meet Zheng Peifeng and Zhu Linfeng, Paul Drinkhall and Liam Pitchford confront Koki Niwa and Jin Ueda; in the opposite half of the draw it is Nandor Ecseki and Adam Szudi versus Liao Cheng-Ting and Lin Yun-Ju, Lubomir Jancarik and David Reitspies in opposition to Ma Long and Xu Xin. The quarter-finals and semi-finals of the Men’s Doubles event will be staged on Friday 17th August.